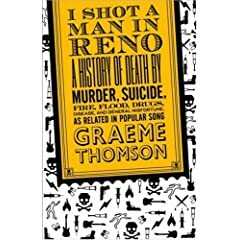 Death and mortality are surprisingly common themes in popular music, and Graeme Thomson explores these themes in I Shot a Man in Reno: A History of Death by Murder, Suicide, Fire, Flood, Drugs, Disease, and General Misadventure, As Related in Popular Song, a book that music fans will cherish not only for its lists of songs and cultural insights but also for the discussions it is sure to spawn over which songs were left out of the book. I wrote I Shot a Man in Reno not because, as some people think, I’m obsessed by death, but because I’m obsessed by music and I’m always looking for ways to write about it from a new angle, preferably one that intersects with the wider world. Death proved a rich seam. The first eight chapters in the book are arranged thematically, covering everything from murder to depictions of the afterlife, and my song-mix follows suit. The list covers the songs that best sum up what I’m driving at in each chapter. They may not be the songs I lavished with the most words, they may not be the most prominent songs in their field, but they’re the ones that focused my thoughts regarding what I was writing about, and why. This recording became hugely popular when it was used in O Brother Where Art Thou, which still amazes me because it’s really quite extraordinarily bleak. The sense of foreboding is accentuated by the fact that it’s sung a capella - just an old man from the mountains asking death to spare him over for another year. I used the song as the centrepiece to the opening chapter, where I look at what modern music has borrowed from old time songs – and what it has ignored. “O Death” is one of the best of many examples of the way old ballads directly conversed with death, which I can’t help thinking is a more healthy approach than the one society encourages today, where we have become a little too adept at sweeping thoughts about our own mortality under the carpet. Here, death is merciless, impervious to any emotional bargain pleas or bribes. Which is how it will be. Some teen death songs from the early sixties are consciously camp and corny; nothing wrong with that: I love stuff like “Leader of the Pack” and “Ebony Eyes”. But this – this rolls along with the real taint of sorrow. I don’t know what it is. Maybe the forlorn bass rhythm; maybe the ache in the singer’s voice. Or perhaps it’s the fact that it is based on a true story of teen tragedy. Whatever. It has me. There are loads of great murder songs, but for me this one has it all: brilliant, scary, slightly comic and yet slyly profound. I love the characters – Reba the Loon; Sam the Crank - I love the atmosphere, I love the creaking, clankingly ominous instrumentation, but most of all I love that line: “For some murder is the only door through which they enter life.” I’d listened to the song scores of times before that line hit home, and it really clarified a lot of things for me when I was writing about murder in music. A landmark recording. With its drone and sitar-like drag, this marked pop music’s first significant eastward glance; the Beatles swiftly followed suit. Lyrically, it’s pretty sparse and opaque, but when you realise that it was written about Ray Davies’ sister, who died when he was 13, it starts to fall into place. I always get an image in my mind of someone sailing on a river between the living and the dead. Sad but also somehow comforting in its sense of a continuing connection. I love all these mid-sixties songs of mortal exploration, stuff from Pet Sounds, Revolver, Forever Changes and Astral Weeks. At the time many artists seemed to view death as a great adventure, something that had to be glimpsed and understood in order to fully understand life. I’ve always hated songs that moralise about addiction and self-abuse. Those stupid, banal ‘don’t do it’ songs. No stranger in my former life to the damage wrought by strong drink, I can’t stomach those kind of black or white moral judgements. This track pulls off the neat trick of sympathising with an old drunk without sparing us the horrors that come with the territory. Thompson invests his soak with a certain fool’s nobility which is rather touching – he is a heroic dreamer in a world of pedants and pen-pushers. Then again, he also lets us see him wetting his pants and trembling with the DTs, which is worth a hundred empty platitudes. I absolutely lost myself in this song when I was writing the book. I didn’t know it very well when I started; at least, I hadn’t listened to it properly until I started on a chapter called “Sweetness Follows?”, where I examine the different ways in which songwriters deal with what lies beyond death. On the one hand, Wonder’s song is incredibly self-righteous and pious in its portrait of an afterlife that has to be truly earned; where the human detritus of this world, the liars, the sinners, the greedy, will be shaken off like fleas from a sick dog’s pelt. He pulls it off because the music is so remarkably deep and sonorous and because of the sheer conviction in his voice. I don’t agree with what he says, but for six minutes he makes me believe it. I listened to loads of rap while writing the book; although it’s dense with words, I find it strangely easy to write while it’s playing. Of course rap is full of death but very few raps songs talk about the consequences. “Seen a Man Die” travels beyond the bloody cut and thrust of the genre’s devotion to violence – it’s smoky and dark and full of dread rather than machismo and bloodlust. His voice is just bewitching. I could listen to it all day although I’m not sure that would be healthy. Brilliant video, too. Songs of loss and bereavement don’t necessarily have to draw their emotional force from autobiography; a work of fiction can be just as affecting. I love the fact that Prince – who isn’t by any means the most soulful or naked of writers; at heart he’s an old school showman - can write this kind of ballad. It was composed for a really terrible, trashy film, and yet it still tugs incessantly at the heart strings. I also like the fact that he’s singing to (or for) another man, which gives the song an ambiguous edge and somehow makes it seem all the more heartfelt. My brother went to see Prince play in London last year and at the end, after half the crowd had left, he came back on and played this on acoustic guitar. So jealous.